Have you ever velveted chicken before? Well I learned a super simple form of it reading this recipe from Tin Eats, and now you will too! First off, what is velveting? Here we're just using baking soda, but it still works! The technique lives up to it's name by giving the chicken a soft, velvety texture. I'll definitely try the more complex version of velveting in a future recipe, but this one is great when you're just trying to make dinner after getting home from work. We'll also be using the velveted chicken in a veggie stir fry! To start off, we're going to velvet the chicken. 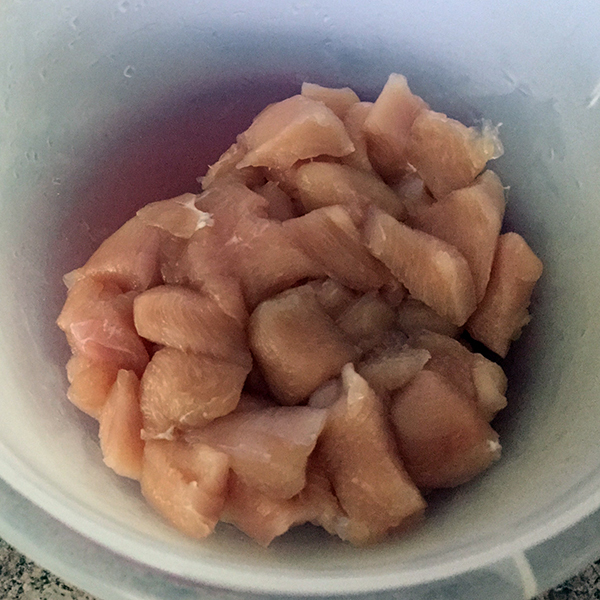 Put the chicken in a medium sized bowl and add the baking soda over the top. Shake or mix around until the baking soda has been evenly combined with the chicken. Let it marinate on the side for 15 minutes. Don't let it go for longer than 15 minutes or the texture starts getting really bizarre. While the chicken is marinating we'll make the sauce. In a medium sized sealable bowl or jar combine the soy sauce, dry sherry, oyster sauce, sesame oil and white pepper. Secure the lid on top and then shake thoroughly. When the chicken is done velveting rinse the chicken thoroughly in water to remove the baking soda. Pat the chicken dry after. Measure out 3 tbs of stir fry sauce and combine it with chicken in a new bowl. Now let that marinate for 20 minutes. You could probably reuse the velveting bowl as long as you ensure all the baking soda has been washed out. White waiting again you can add the cornstarch and water to the stir fry sauce. Shake thoroughly and set aside. Chop up your veggies and your garlic. I started cooking the onions ahead of time on low heat with a tbsp of oil. I let them cook for around 8 minutes, stirring occasionally, until the chicken was done marinating. After 20 mins, that chicken is ready to cook! In a wok or heavy skillet, add in the peanut or vegetable oil and heat it over medium-high heat. Once the oil is hot add in the garlic and cook it for 15 seconds, stirring the whole time. Add in the onions and let them cook for a minute. Add in the chicken and let it cook for 2 minutes. There will still be pink. Pour in the veggies and stir for a minute. Next, add the stir fry sauce and make sure the chicken and veggies are coated in the sauce. Turn the heat down and let it all simmer until the chicken is fully cooked. That was about 3 minutes for me. Serve over rice or stir fry noodles. You can top it with sesame seeds or scallions, or add a little Sriracha to kick it up a notch. Enjoy!